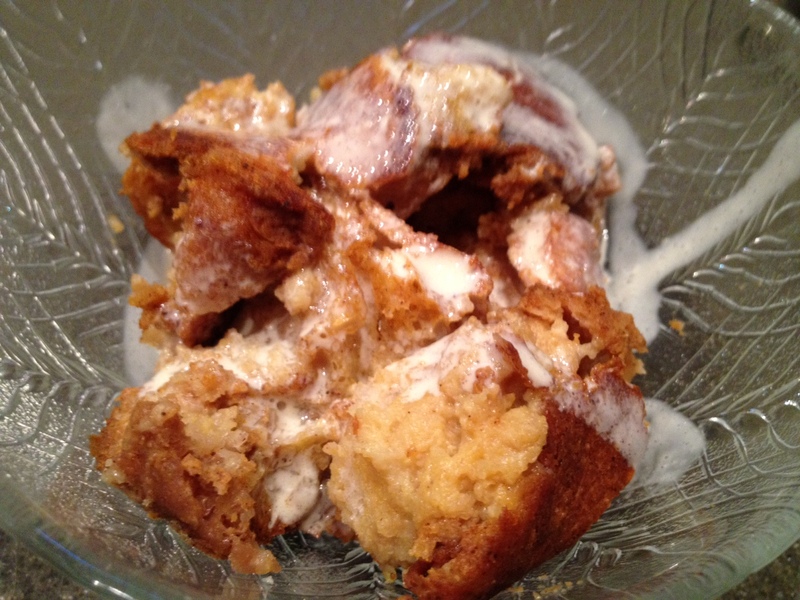 I found a yummy looking recipe for pumpkin bread pudding on Smitten Kitchen from back in 2007! Their recipe was adapted from Gourmet magazine and you can find their original post here. I used more bread than I should have so to make the dessert creamier and less dry, I added creme anglaise sauce on top. Both recipes are listed below. 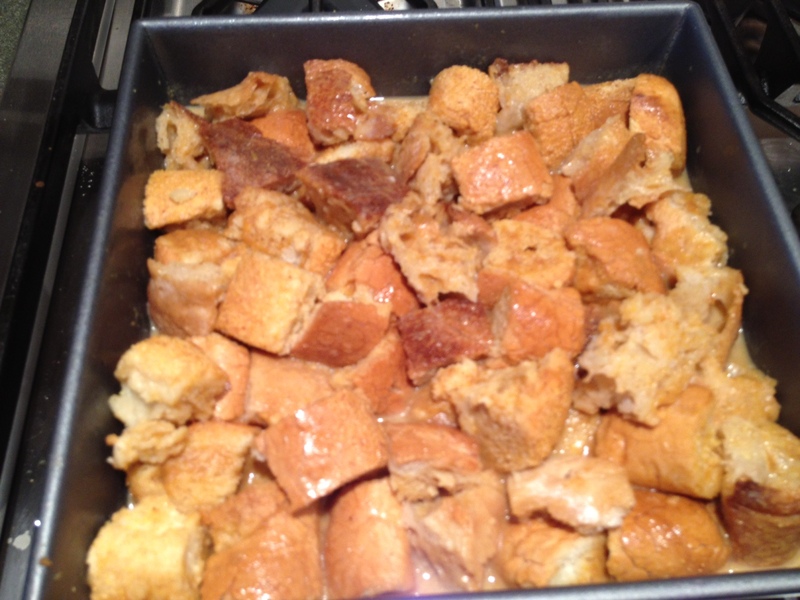 The bread pudding calls for almost the exact same ingredients as a traditional pumpkin pie so this recipe is great if you are looking for that pumpkin pie flavor but a different texture dish. Creme anglaise is a great recipe because it is so versatile – it can be served warm, cold or room temperature. In addition to serving on top of bread pudding, I also like to eat it with berries in the morning for breakfast. 1. Preheat oven to 350 with rack in middle. 2. Mix together dry ingredients (sugar, salt, cinnamon, ginger, allspice, cloves). 3. Slowly add eggs, milk, pumpkin and bourbon until well mixed. 5. Bake until pudding is set, which should take about 25-30 minutes. 1. Whisk egg yolks in 2-quart saucepan, adding the sugar by fairly rapid spoonfuls – if it goes in all at once, the yolks can turn grainy. 2. Continue beating 2-3 minutes, until the mixture is pale yellow and thick. By dribbles, stir in the hot milk – stirring, not beating, because you do not want the sauce to foam. 3. Set the saucepan over medium-low heat, stirring slowly with a wooden spoon and reaching all over the bottom and sides of the pan. The sauce should gradually come near – but not to – a simmer. You must be careful not to over heat it as this will scramble the yolks. Indications that it is almost ready are that the surface bubbles begin to subside, and almost at once you may see a whiff of steam rising. 4. The sauce is done when it coats the wooden spoon with a light creamy layer thick enough to hold when you draw your finger across the back of the spoon. 5. Next beat in the vanilla, butter and run. Spoon on top of bread pudding. Sauce can be refrigerated in a covered container for several days.